Manhee: Why do you take pictures? Claire: Because the only way to change things is to look at everything again very slowly. Claire is all smiles at Cannes. In her yellow trench coat and watch, ocean blue Chanel shoulder bag, and straw hat, she’s the walking reflection of Paris at the Riviera. Her friend has a film showing at the festival, and Claire accompanied her there from the sophisticated City of Lights where Claire herself teaches music but also writes poetry and likes to take pictures with her Polaroid. This last detail becomes significant in the 20th feature film by South Korean auteur Hong Sangsoo, Claire’s Camera. With her incessantly popping lens, Claire (Isabelle Huppert) is a good stand-in for the writer-director; he’s made 15 features in the last decade alone. But that’s not the reason. Claire speaks for Hong in her wily ways, her insouciance masking a probing eye – on people, romance, disillusionment, life. And her buoyant nonchalance allows her to be open – to strangers, foreigners, even if neither she nor they have a full command of a common language. They use simple words, halting speech, and repeat a lot as they buy time to pause and reflect with each other. This seems to be exactly what Claire wants: to stop time a bit with her camera, time to look again, to regret a deed or embrace a new feeling, to see things differently. A strolling tourist, Claire takes up with a few new acquaintances, all Korean, it turns out. Like her, they’re in the arts. A demure young woman who sells films, Manhee, has just lost her job. A handsome middle-aged man, Wansoo, is a director and has a film in the competition. A more matronly lady, Yanghye, represents his work as his sales agent. But Cannes is buzzing with business and people with projects from everywhere. How would Claire know that these three are somehow “connected” – or are they? Or does she know? 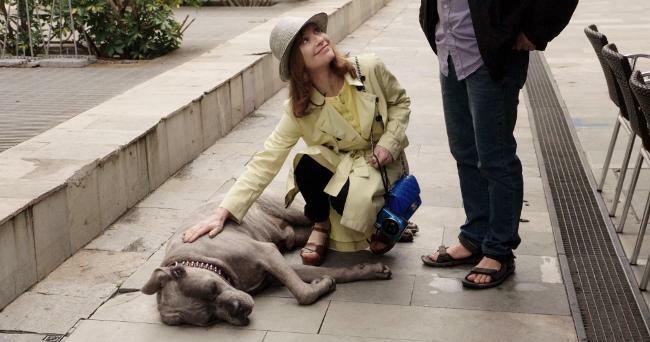 The closest clue is an enormous gray dog who lounges gracefully on the pavement of a sidewalk café. He’s seems a mystical link, looking like a meek-mannered Cerberus, signifying the Hound of Hades as the tone of the film emerges. It’s no longer sunny like Claire’s yellow knit jacket, her golden red hair, her warm disposition. In fact, the emotional conflicts among this tormented trio are quietly raging like the choppy waves in the sea and the gusty wind whipping it up. Secrets and lies leak into the atmosphere, but whose? And were they really lies? Were they so secret at all? “Honesty” is a word that fills the talk and stirs up the air with doubt and suspicion. But what could be more honest than Claire’s camera? And yet Hong is not content to proceed with the simple maxim, “Pictures never lie.” Rather, he is interested in how they change us, or trace the mood and the undercurrents surrounding us, how they freeze time as we gaze at them – or even more so, how that time becomes ours, our subjective, emotional time, as we try to make objective meaning or at least find our own truth. Not unlike Eric Rohmer’s 16mm camera and Nagra floating through Paris or Provence recording his muses, Hong follows his actors, all “regulars” by now in varying degrees, walking and talking through Cannes, mostly the beaches, rock jetties, restaurants and rooftops, catching their faults and foibles that get them into trouble with each other, the camera often wiser than the subjects, or more forgiving, gracious, humane. In Hong’s lens (as in Claire’s), it’s the unvoiced excesses that find themselves in the frame – bad habits, misdeeds and traumas somehow gain 20 pounds in front of the lens the way people do. “But that man, he was a terrible drunkard,” remarks Claire. Or “But why did your boss think you were dishonest?” Claire is more than an adventurer with a camera; as a music teacher and poet, she’s a good listener. She not only looks; she hears, and she trains the others to observe. Her pictures are like puzzle pieces – they don’t answer, but they fit. “If I take a photo of you, you are not the same person anymore,” she insists. The drinking filmmaker Wansoo doesn’t believe her, though she asks him to try it out with her. “Look at me – don’t you see I’ve changed?” she asks. “Look harder.” They gape at each other. He can’t see the difference. But we do – when he leers at the young Manhee at a rooftop party and insults her for her hot pants and make-up, a different look from when he was with her last. “I’m with someone else now,” she says. He’s ferocious. She’s hurt. In a separate scene, with the other woman, Yanghye, his staid sales representative, he argues that they can work better together if they return to a “strictly professional” relationship. They agree. Does either of them really believe it? I didn’t know that Hong Sangsoo actually studied film in my neck of the woods, Los Angeles, and borrowed the title for his first feature, The Day a Pig Fell into the Well (1996), from John Cheever. While Hong’s latest is less obscure and seemingly less formally innovative (in both the production process and result) than his first, perhaps it asks deeper questions and its simplicity actually makes it a more sophisticated work. Claire’s Camera went into production as Isabelle Huppert was at Cannes promoting her film, Elle, which couldn’t be more radically different from Claire’s Camera; by comparison, Hong’s film is a very short, small work, low-budget, mellow, and “natural,” with quiet, everyday events, a contemplative pace, and location shooting. Isabelle Huppert appears to be disconcertingly innocent compared to her savvy and crafty role in Elle. That said, she’s uncanny as Claire. Hong’s stationary shots, lapping up long takes from the actors even if the camera zooms or pans from a fixed position, are deceptively simple. Two-shots at a medium distance are his staple, but the frames “grow” on us as they reveal more and more in our focused thoughts, especially given that the film uses irregular flashbacks, fragments of action responding to newly arising questions, rather than chronology – another way in which the camera plays with time. There are the characters, now familiar, who are artists of one kind or another, the salespeople, the stolen lovers, the drunken sops, the self-loathers, who seem to turn up in all of Hong’s films, first to last, not to mention the self-reflexive presence of cinema. There are still the tricky twists of situations, the quirky turn of events, the dives into bathos played for just that. Yet perhaps here, In Another Country (2012) comes to mind, Hong’s charmingly non-stop funny film, in which Isabelle Huppert (her first with Hong), plays herself, so to speak – three different women but all named Anne, a celebrity actress – in a Korean beach town. It’s a kind of first bookend with Claire’s Camera, whose early lines let Isabelle Huppert exclaim, “I’ve never been to Cannes before!” (Perhaps these days, no actress has been there more, even as juror and Mistress of Ceremonies!) Hong is very good at farce, and particularly good at what may well be self-inquisition. He filmed Claire’s Camera in 2016, the same year he filed for divorce from his wife and publicly claimed his relation with Kim Min-hee, who plays the young sales associate in Claire’s Camera and is now his real-life partner. Director: Hong Sangsoo; Producer: Jeonwonsa Film, Lee Jeahan; Screenplay: Hong Sangsoo; Cinematographer: Lee Jinkeun; Editor: Hahm Sungwon; Sound: Kim Mir; Music: Dalpalan. Color, 69 min., English and Korean with English subtitles.